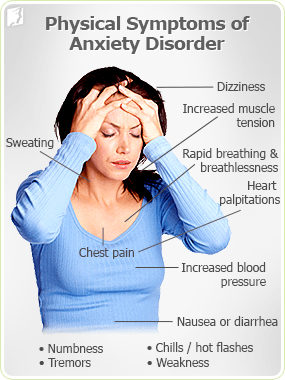 Approximately 18% of American adults have anxiety disorders. People who experience anxiety often cannot seem to shake their concerns and worries about everyday events, even though they may know that their anxiety is out of proportion to the triggering situation. Anxiety can make a person go through the entire day with exaggerated fear and tension. At night, it can wake someone from sleep or make falling asleep extremely difficult. Anxiety can put someone on edge, making it feel as if disaster is always just around the corner. This can make life feel overwhelming and even unbearable. Moderate to severe levels of anxiety can put a significant strain on personal and professional relationships, as well as negatively impact self-esteem. Anxiety produces more than just psychological symptoms. People who suffer from anxiety typically experience a host of physical symptoms, ranging from heart palpitations to muscle aches and fatigue. These symptoms may be especially intense for people who experience panic attacks, or sudden and acute episodes of overwhelming fear and panic. Read on to learn more about the symptoms of generalized anxiety and panic attacks. Everyone has experienced anxiety from time to time. It is normal to have concern about daily necessities, worry about loved ones, and fear stressing situations. However, some people experience more intense anxiety most or all of the time. Because of extreme hormone fluctuations, women who are experiencing menopause are more vulnerable to anxiety disorders. Generalized anxiety disorder can often provoke a number of physical and psychological signs and symptoms. These symptoms often persist throughout the day, though they may be more intense at certain times or in the presence of certain triggers. Anxiety attacks, often called panic attacks, also produce a distinct set of physical and psychological symptoms. The symptoms of panic attack often peak after 10 minutes, though some symptoms can last much longer. Panic attacks can make a person feel as if they are losing control. A person may feel out of touch with reality or themselves. Additionally, people who suffer from panic attacks commonly experience intense worry or fear about the next attack, the onset of which is usually unpredictable. Panic attacks are, by nature, extremely distressing events. Some people describe them as violent, because episodes often produce feelings of suffocation, nausea, trembling, and dizziness. Many report that panic attacks can feel like heart attacks, since such episodes can drastically increase blood pressure and heart rate. During menopause, it is not uncommon for women to experience these symptoms of anxiety, including panic attacks. Undoubtedly, anxiety can cause a person distress. While most women during menopause do not develop symptoms of anxiety strong enough to require professional care, it is very important to know when to talk to a healthcare professional. Read on to learn more about when to contact a doctor or psychiatrist regarding the symptoms of anxiety. Many women who experience anxiety during menopause have mild symptoms and, thus, do not typically require medical attention. However, any woman who is concerned about her anxiety symptoms during menopause should consult a qualified healthcare professional. 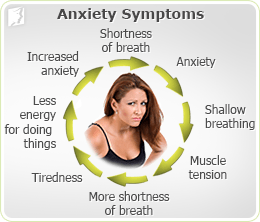 Women who experience the symptoms of anxiety for an extended period of time - more than six months - should speak with a primary care doctor or a psychiatrist. Women for whom symptoms of anxiety impede daily functioning or interpersonal relationships are also encouraged to seek medical attention. Fortunately, anxiety disorders can be treated successfully. Now that the symptoms of anxiety have been explored, the next step is to understand what causes anxiety, both in menopause and at other times in life. Read on to learn more about the causes of anxiety. Anxiety disorders affect 40 million Americans on average, and is twice as common in women as in men. Social anxiety disorder is defined as the overwhelming fear of being publicly humiliated. Common symptoms of social anxiety disorder include sweating, nausea, and avoiding social situations in fear of being embarrassed. There are several different types of anxiety disorders, including post-traumatic stress disorder, social phobia, and panic disorder, but their symptoms are similar. Emotional symptoms of anxiety can include restlessness, irritability, difficulty concentrating, and constant feelings of dread. Anxiety and depression are linked and often arise from the same causes. This means that many of the signs of anxiety are also typical of depression, so it is important for an anxiety sufferer to recognize when they might be exhibiting signs of depression too, so that it does not go untreated.